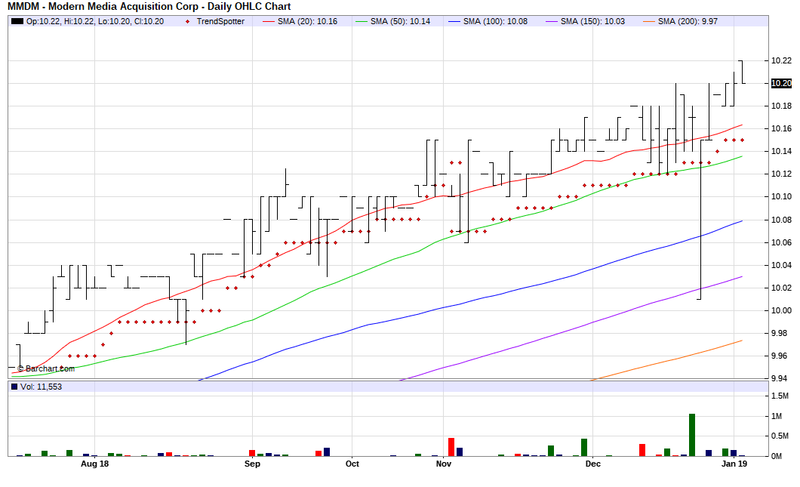 The Barchart Chart of the Day belongs to a blank check company Modern Media Acquisitions (MMDM). I found the stock by using Barchart to sort its Top Stocks to Own list first by the most frequent number of new highs in the last month, then used the Flipchart feature to review the charts for consistent price appreciation. Since the Trend Spotter signaled a buy on 10/6 the stock gained .49%. Modern Media Acquisition Corp. is a blank check company. It is formed for the purpose of effecting a merger, capital stock exchange, asset acquisition, stock purchase, reorganization, recapitalization and similar business combination with one and more businesses. Modern Media Acquisition Corp. is based in Atlanta, United States.